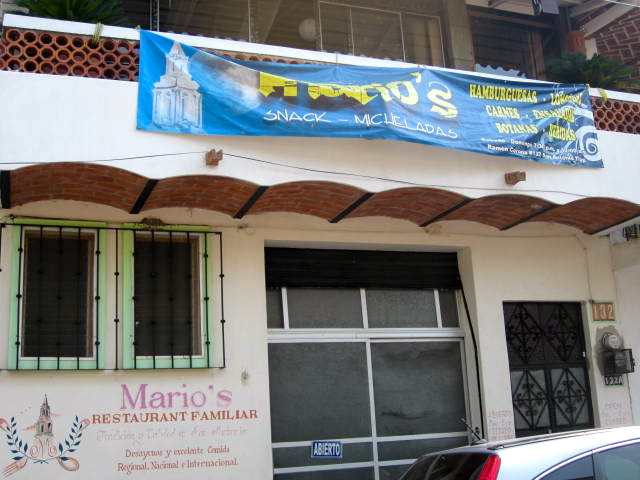 Mario’s Restaurant is located half a block from the San Antonio Plaza. If you don’t have a car, the small buses go through town and stop at the plaza. It is an interesting area to visit on your way to Mario’s. There are almost a hundred restaurants listed in the Lakeside telephone book and many more that aren’t listed. Restaurants come and go, here one week and gone the next. There is fierce competition in the restaurant business. So, what is the secret to staying in business? From what I have seen, there are several secrets. Number one, of course, is delicious food. That means a clean restaurant and kitchen. The service must be timely and the waiters friendly. Few of us like to eat in a restaurant where we are treated indifferently or rudely. Hired help sometimes will be like that because they are bored or thinking of their own lives. Restaurants run by the owners are much more likely to be more efficient and friendly. Also, if the family is running everything, the costs go down and the service goes up. It helps if the family owns the building. High rent can put a restaurant out of business and sometimes the landlords will raise the rent once they see that a restaurant is successful. A love of food and a willingness to continue learning new recipes is essential for a good cook. Owners who do the cooking usually take pride in their cuisine. Mario’s Restaurant has all of these ingredients. It is well established. It has been in business for twenty-eight years. It started out as the family home and most of it was converted into the restaurant. 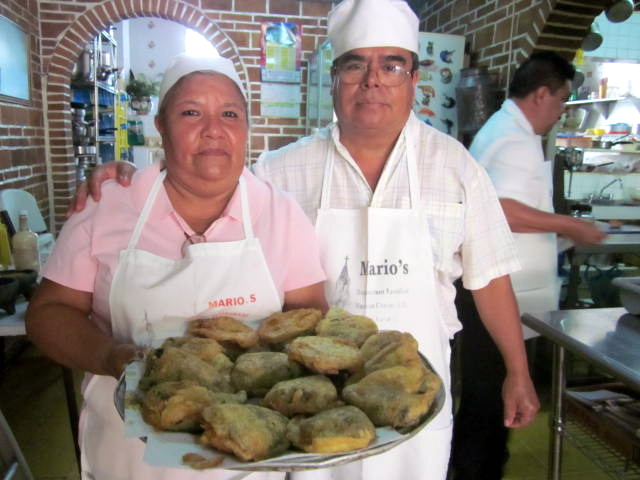 Mario Paz Garcia and his wife Maria Santos Garcia do most of the cooking. Other family members also work in the restaurant. Mario’s brother-in-law, Jamie Enciso Ibarra, waits tables. Mario and Maria’s only child, now twenty- five years old, also works there. He has been working there all of his life. Even as a child, he helped out. His name is Abel Paz Enciso. Mario’s has a comfortable, welcoming atmosphere. 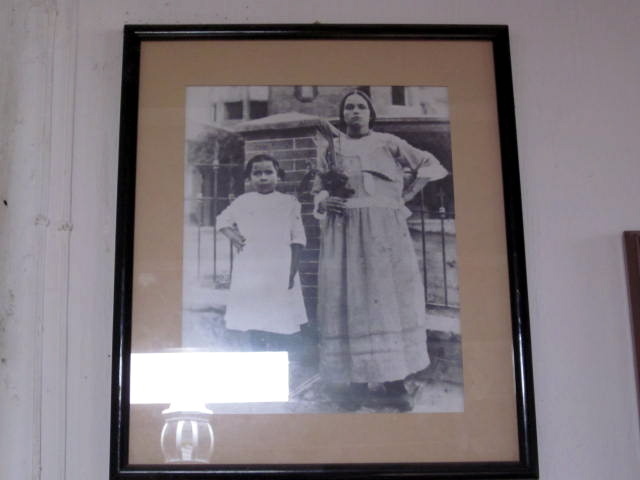 The walls are lined with interesting objects from the area and family photos. It is obvious that the family plays a large part in Mario’s life. There are four tables in a garden area outside. It can seat twenty people. There are six tables inside that can seat over thirty people. The upstairs area can seat between twenty and thirty people. Of all the restaurants in the Lakeside area, very few call their food Traditional Mexican Cuisine. 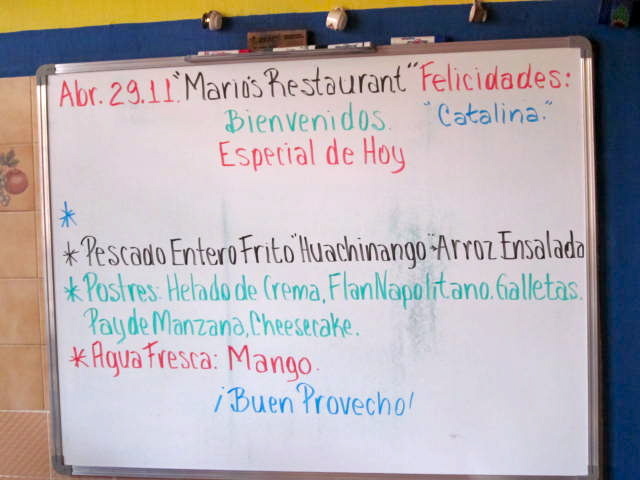 It is a treat to go to Mario’s and find a menu filled with Mexican dishes. They don’t even have a menu in English, so take your dictionary if you don’t speak Spanish. But they will gladly interpret it for if you are too hungry to practice your Spanish. Mario’s serves breakfast all day. 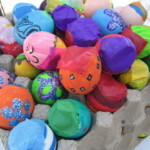 There are fourteen egg dishes ranging in price from $35 to $60 pesos. There are nine Omelet dishes ranging from $60 to $70 pesos. There are many repeat customers. Because they are centrally located and have delicious food and reasonable prices, people working in the businesses in the area come in often. 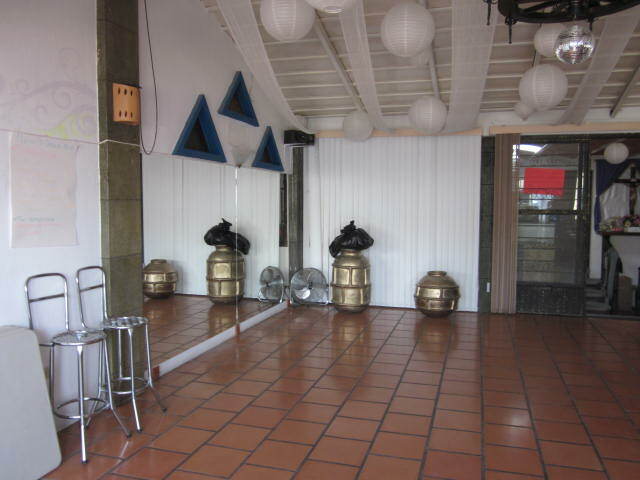 The customers are fifty percent expats and fifty percent Mexicans. Everyday there are different specials. Mario has a bulletin board with the specials listed on it. Some of the specials are: Swiss cheese enchilada, Birria, Chili Rellenos with meat or cheese, chicken cordon bleu. The price of the special is usually $70 pesos. You can also order from the regular menu. They have six chicken dishes. 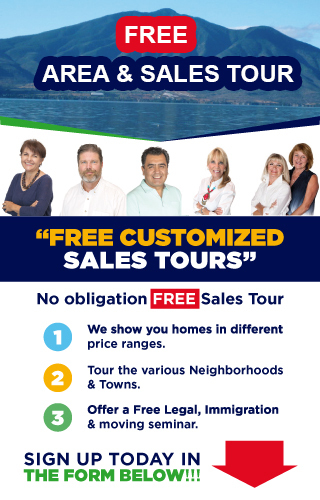 Price ranges from $60 to $75 pesos. There are five salads, which range in price from $30 to $100 pesos. There are six different kinds of hamburgers ranging from $50 to $70 pesos. 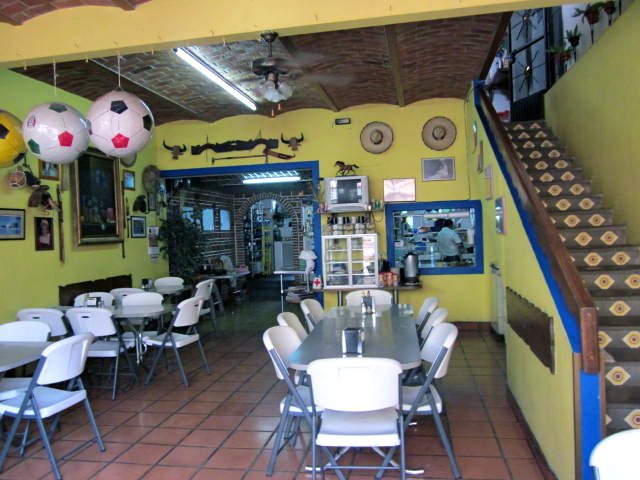 There are eleven different meat dishes ranging in price from $60 to $110 pesos. 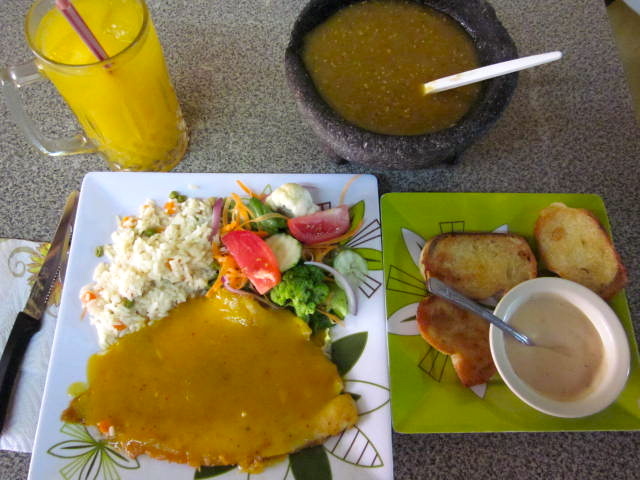 There are seven fish dishes from $80 to $85 pesos. There are eleven shrimp dishes. All are $110 pesos each. Don’t forget the deserts, three of them for $20 pesos each. 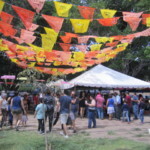 There are thirteen different drinks, including beer, margaritas and delicious natural fruit drinks. Prices range from $12 to $35 pesos. This is an extensive and varied menu. Mario loves to cook. He also loves listening to romantic Mexican music on the radio. He keeps it on low so it won’t disturb the customers. It is nice to hear it in the background while enjoying his delicious food. Mario has been cooking for many years. He started out learning from his mother. 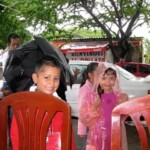 He worked for twelve years as a cook at the Real De Chapala. He studied for two years at the Colegio Gastronomica International in Guadalajara. He graduated but he still takes cooking classes. He is always learning and changing his menu. 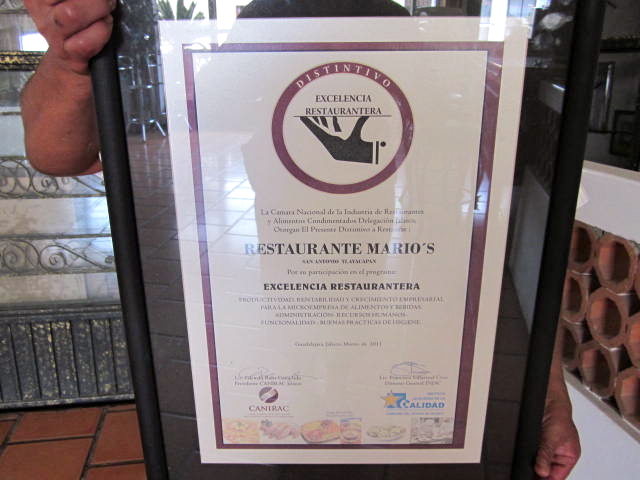 Mario is proud of an award he received from the National Restaurant Industry as a Restaurant Excelencia. Mario had four brothers. One of them passed away. He has four sisters. The family has been living in the lakeside area for generations. Mario’s brother Gilberto Paz Garcia owns the liquor store in the San Antonio shopping center. His brother Leopold Pas Garcia owns Super Lake grocery store in the shopping center and the Hole in One restaurant. 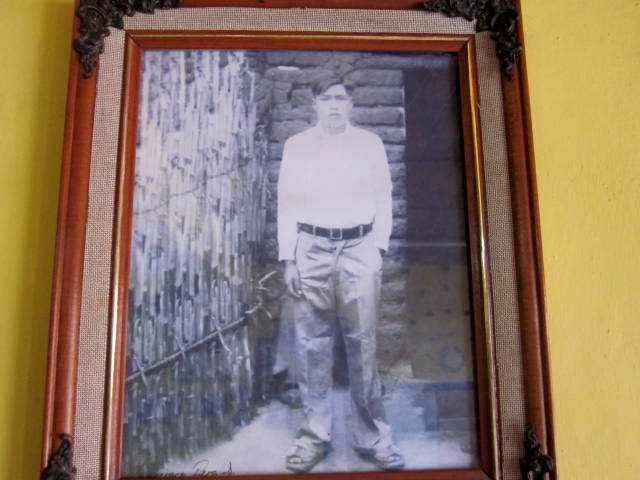 The oldest brother, Jesus Paz Garcia, is a priest near Acapulco. 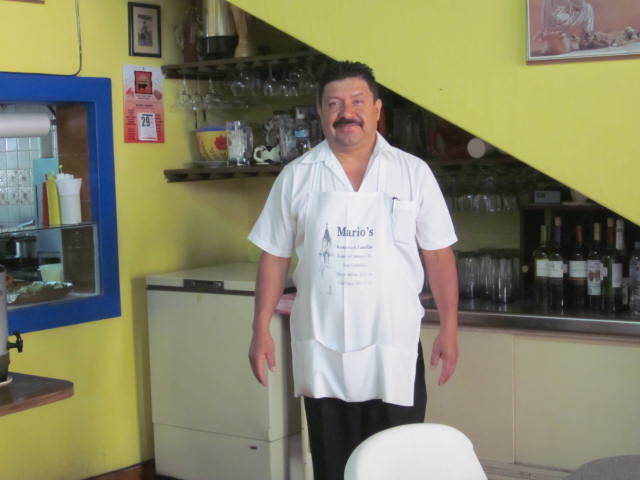 Mario’s sister and her son own Lety’s Restaurant on the Carretera. They have some of the same dishes, including the delicious mango fish and mango shrimp. 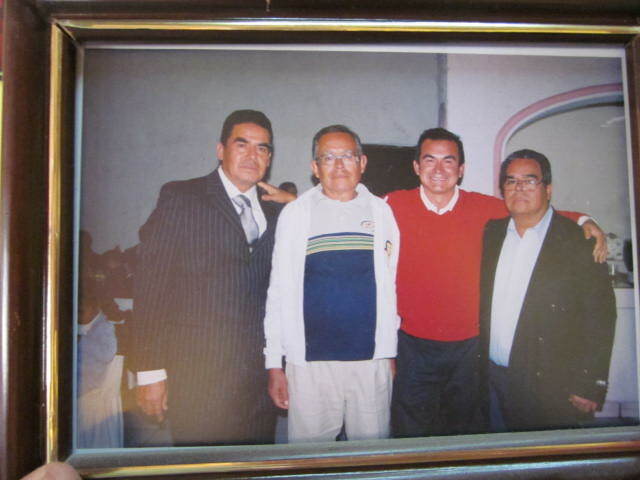 Mario’s father, Domitilo Paz Ernandez passed away thirty years ago. It is unfortunate that he didn’t get to see how successful his children have become in the community. 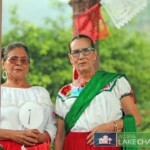 Mario’s mother, Maria Garcia Soto is ninety-five years old and still going strong. Mario and his family live upstairs in the same building as the restaurant. That is one secret to success in this highly competitive business, no rent. Mario’s son, Abel Paz Enciso, teaches a folkloric dance class for children in the community. It is upstairs. The class is on Monday from four to six p.m. Cost is only ten pesos each class. 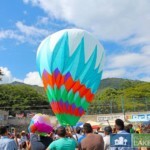 It is for the local Mexican children. He also takes them out into the community to do performances. When I was there, I had the mango fish special with fresh mango water. It was all delicious. Next time I am going to try their chili rellenos. The restaurant hours are from nine to five everyday except Monday. They are open all year around with no holidays. They will deliver meals but only to places close to the restaurant. To repeat, Mario’s has all the elements of a continuing successful restaurant; delicious food, friendly staff, reasonable prices, clean, convenient location, well established and maybe the most important element—— a strong family to keep it going. It is a restaurant not to be missed. I plan to go there often.